This is an typed letter signed from Ford Motor company industrialist Henry Ford, on his personal embossed letterhead, dated September 9th, 1913 to W.G. 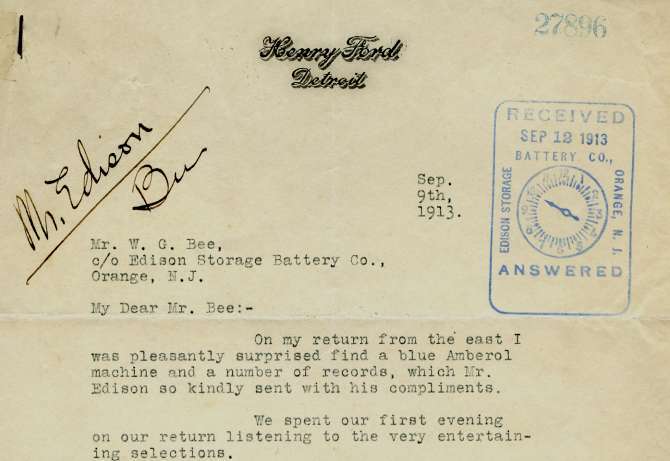 Bee of the Edison Battery Storage Company expressing his appreciation for the blue Amberol machine that Thomas Edison sent with his compliments. He goes on to express his wish that his kindest thanks be expressed to Mr. Edison for sending the player for Ford to try out and his pleasure at knowing that it came from Mr. Edison direct. The letter is also stamped in blue ink (upper right corner) with an Edison Storage Battery Company received / answered date stamp and a blue ink identification number 27896. This is an early signature of Henry Ford. Blue Amberol Records was the trademarked name for cylinder recordings manufactured by the Edison company in the U.S. from 1912 to 1929. They were issued as a replacement to the 4 minute black wax Amberol cylinder introduced in 1908 which in turn replaced the 2 minute wax cylinders that Edison had been producing. Blue Amberols run approximately four minutes and were made out of the "indestructible" plastic, celluloid, which was issued in the trademark blue color. Henry Ford (July 30, 1863 � April 7, 1947) was an American industrialist, the founder of the Ford Motor Company, and sponsor of the development of the assembly line technique of mass production. Ford did not invent the automobile, but he developed and manufactured the first automobile that many middle class Americans could afford to buy. His introduction of the Model T automobile revolutionized transportation and American industry. As owner of the Ford Motor Company, he became one of the richest and best-known people in the world. He is credited with "Fordism": mass production of inexpensive goods coupled with high wages for workers. Ford had a global vision, with consumerism as the key to peace. His intense commitment to systematically lowering costs resulted in many technical and business innovations, including a franchise system that put dealerships throughout most of North America and in major cities on six continents. Ford left most of his vast wealth to the Ford Foundation and arranged for his family to control the company permanently.